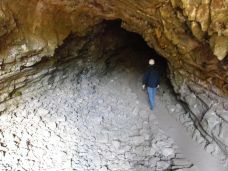 The Lava Beds National Monument is a great location for cave exploring, hiking, or sightseeing. The National Monument has the largest concentration of lava tube caves in North America. It also features several lava flows, hiking trails, and Captain Jack’s Stronghold. Click here to share your story about this National Monument. From the Klamath Falls, Oregon, take Oregon Hwy. 39 south approximately 20 miles until it enters the town of Merrill, OR. Approximately one mile south of Merrill, turn right (south) on Malone Road. Travel south on Malone Road approximately 2 miles until you reach Stateline Road 161. Turn left (east) and then take the immediate right at Westside Market onto Hill Road. Entrance to the park is $10 for private vehicles and is valid for 7 days. (There is a reciprocal agreement with Crater Lake National Park and your entrance fee is valid for a visit to both parks since they are both members of the National Park Service.) The National Monument has over 300 caves with detailed maps to about 25 of them. The first-time visitor should proceed to the Visitor Center to get detailed maps to the caves, to watch a 20-minute video about the park, and to see some interesting artifacts of the history of the park. A short drive from the Visitor's Center is a place for RV camping and tent camping. Click this link for more information about camping at the National Monument. Sentinel Cave is classified as an easy cave. There are high ceilings and the path is relatively easy. 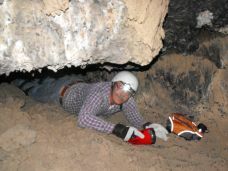 Thunderbolt Cave is a good example of a moderate or difficult cave. It is the first cave on the cave loop. This opening is only one and a half feet tall and the only way to get through is to crawl on your belly. All visitors to the caves are encouraged to “cave softly” and “cave safely’. Cave Softly means to stay on the trails, leave no trace of your visit behind, do not touch natural formations, use only battery flashlights, do not touch or disturb natural paintings or artifacts, observe seasonal closures to protect bats, and pets are not permitted in the caves. Cave Safely means to never go alone, choose caves that are appropriate for your group, each member should carry their own flashlight, protect your head, wear proper clothing for the type of cave you are exploring, pay close attention to your route so you don’t get lost, and know your level of fatigue. Besides having proper light, it is also a good idea to have protection for your head. Even some of the easy caves have low ceilings. Bring a bicycle helmet or a plastic helmet and a light sweater or jacket. 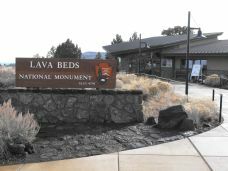 Click here for more information about the Lava Beds National Monument. Captain Jack’s Stronghold is located on the northern edge of the park. This collection of lava rocks was a natural hiding place for the Indians during the Modoc War. Return to Home Page from Lava Beds National Monument Page.